There’s no other publication like this on earth for colored pencil artists. Over 80 artists from 13 countries share their stunning colored pencil art, what makes them tick as artists; and then, going a step beyond, they reveal their secrets, tips and techniques. First, soak in the beauty of the art & mastery of the medium, then settle in and learn: · How to get “in the zone” · When and how to burnish · How many reference photos are enough? · What can a “magic eraser” do for you? · How to see color · So much more! Instruction and inspiration in one beautiful package, documenting the wonderful journey that the "lowly" medium of colored pencil is taking throughout the world. It will fast become a "treasure" in your colored pencil library. This title also available in a Premium Satin Gloss Edition on the author's website. Known for her dedication and enthusiasm for excellent colored pencil instruction, Ann Kullberg began using colored pencil in 1987 and hasn’t looked back since. Her sheer love of the medium has driven her to write colored pencil instruction books, a monthly colored pencil magazine, create instructional materials and hold hundreds of portrait workshops throughout the US, Canada, Japan, the UK, and on cruises. Ann is the author of the following North Light books: Colored Pencil Portraits Step by Step, Capturing Soft Realism in Colored Pencil and Colored Pencil Secrets to Success. 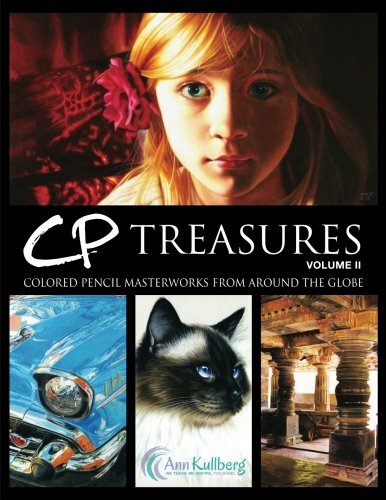 Kullberg has also self-published CP Treasures, Volume I. Ann Kullberg’s Colored Pencil Magazine begins its 15th year in publication in 2014, with thousands of loyal and enthusiastic readers worldwide. See more of Ann's publications or find a workshop near you on her website.